Here is my review of Barbara Gowdy’s “Little Sister”, a novel that explores the transferrance of consciousness from one woman to another during lightning storms. Barbara Gowdy’s Little Sister explores ideas of normative minds and constructions of normative psychology. Fiona has gradually been experiencing progressive dementia, experiencing changes in her memory and perception of the world around her. Her daughter, Rose, begins to experience what she calls “episodes” during every storm. She begins to have breaks in consciousness where she seems to be seeing the world through the eyes of another woman, Harriet. She is uncertain if she is having delusions, hallucinations, migraines, or whether she is actually experiencing the life of another woman and seeing the world through her eyes. Lucas Smoke learned the art of carving from his grandfather and finds that his hands seem to move of their own volition to carve figures that he sees in everyday life…. but when he learned the art of carving, his grandfather didn’t teach him the deeper meanings behind his craft, the knowledge that would keep him safe from exploitation. When Lucas’ grandfather dies, his family wars over the man’s possessions leaving Lucas feeling uncomfortable since all he wanted was his grandfather, not his possessions. Lucas leaves the reserve and decides to busk in the city, using his gifts at carving to make some money by carving images of tourists on the boardwalk. When he is approached by a man who offers him a substantial amount of money to carve masks as his grandfather does, Lucas can’t pass up the opportunity to get himself out of a situation of poverty and agrees. 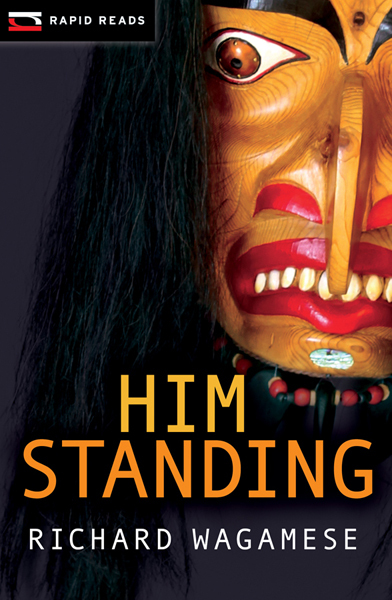 He quickly learns that he is being exploited and that his mask carving, meant to “bring a legend to life” is bringing something into the world that he would rather not invite. Wagamese explores the experience of urban aboriginal youth feeling conflicted about their relationship to history and home. Lucas is tempted by the views into his people’s past that making his mask and entering into the dreaming place provides. There is something alluring for him about seeing his community before European settlement and he feels as though he has connected with some lost part of himself. Lucas feels fragmented, like parts of his own puzzle have been missing. Even his art, although providing a link to his grandfather, feels incomplete, as though some of the most important teachings are missing – as though he has learned the physical acts of carving but not the deeper spiritual meanings or teachings that should have accompanied it. This sense of incompleteness has left him vulnerable to manipulation by white men who want power and are willing to use him to fulfill their own selfish ends. The loss of teachings and ways of understanding create vulnerabilities for others to exploit – skill without cultural understanding is incomplete. Lucas is asked to venture into dreams to carve what he sees and unintentionally connects with an ancient evil that seeks to use him to return to the physical world. Like an addict, he becomes obsessed with dreams, losing track of time, not eating, not sleeping, and being consumed from within. His feeling of incompleteness means that he seeks to fill himself with things that are external to him, trying to attain some sense of selfhood while actually leaving him open to be possessed by an ancient evil. Wagamese looks at the interconnection between story-telling and carving, the ability to make tales into physical things, revealing truths within objects. He examines the power of art and stories to re-shape the world, to bring legends into the living world and change our understanding of the places we dwell in. Sean Moreland creates a fierce, almost painful intimacy with the reader in his short story “The Rosy Boa.” The reader is drawn into a conversation, sharing pains and desires with the text, folded into its papery arms, and kissed on the ears by the black tongue of dialogue. Moreland invites the reader into the world of queer desire, a young man who has fallen in love with another young man in a small town of the 1980s. Like many queer youth, his life is a mix of fear of rejection and the desire to get away from all of the homophobic hate and the persistent threat of violence at home and in public. His desires are stretched between a want for a normal life and a deep drawing toward a potential love interest. The protagonist is perpetually guarded, mediating his feelings for fear of their reception, but he is hyperconscious of every touch of body to body, unsure if these moments of contact are embedded with meaning. Like many queer youth in a small town, the protagonist is hyper aware of the levels of surveillance that gossip and the vigilant enforcement of normalcy have written over the community – everyone is watched, and everyone’s normalcy is policed. He feels watched in his neighbourhood, forever in fear and needing to manage and shape the perception of others about him – for queer youth, a small town is a horror story, a place of threat, observation, and control. Yet, his queerness also puts him in a position outside of the mundane, separate from every day life. When the protagonist is able to visit the house of Cyan, the young man he loves, both are able to indulge in an escape from the norm through costume, wearing an antique feather boa that lets them both dance and play, yet this act of play is heightened by one of fear as darkness rolls in and strange sounds appear. In this place of heightened feeling, the protagonist is able to discover more about himself, opened to the world, where transformation and change are possible and where categorical meanings are disrupted. Love and fear meet in a place of desire that is a “mad mix of heaven and hell”. This heaven and hell create an intimacy beyond the mundane, the normal, the unquestioned. Hunger and desire play together at the edge of fear… and death does not know gender. When I first came across The Puzzle Box, the first image that came to mind was Hellraiser (1987), so I was prepared for my entire reality to be distorted and changed by opening the pages of this book. Like the puzzle box itself, opening these pages changes one, alters perceptions, and changes one’s views of the world. But, it is not a Hellraiser form of change – nothing that utterly obliterates one’s sense of comfort, rather it is a creeping kind of change, a gradual insertion of a new context to reality and a series of questions that opens the mind to new perceptions. There were no ultimate horrors within, merely mysteries, enigmas, riddles…. puzzles. Mysteries are pedagogical and solving puzzles can sometimes be more about figuring yourself out than it is about solving the puzzle itself – it can be about unlocking your own mind. The puzzle box is a nexus for various intertwining stories in this novel, tying together disparate and unconnected lives, all linked by the need to discover something new about themselves and the freeing process of self discovery. Like our memories, the puzzle box can be unlocked, finding worlds of meaning within. Opening the box unburies secrets, particularly those that characters create for themselves by hiding things deep within their own minds. The characters in the various stories in The Puzzle Box are outsiders, people struggling for belonging. The box helps them to discover complexities within themselves that they have ignored and hidden within them. Danger and destiny intertwine when the puzzle box is opened and the box like life itself is a mystery with no answers but also simultaneously filled with essential truths. To find out more about The Puzzle Box, visit Edge’s website at http://www.edgewebsite.com/books/puzzlebox/pzbox-catalog.html . The Puzzle Box overall is a collection of stories about the hidden within, and Eileen Bell creatively employs the notion of the puzzle box as a genie’s lamp, holding within it the power to grant wishes. Wishes open paths to our secret desires, open doorways to our wants, and ultimately ourselves. When Angela encounters a genie from within the puzzle box, she confronts notions of her selfhood, her identity. She discovers secrets about her origins and deconstructs the lies that have been told to her “for her protection”. The walls that have been placed around her by the lies that have been told are opened, torn down, but the revelations within may be even more painful. When genies bring truth instead of wishes, the whole foundation of our ideas of ourselves may be opened up. To read more about Eileen Bell, visit her website at http://www.eileenbell.com/ .